Work Versus Leisure – A Balancing Act? In a conversation with one of my reps it was brought to my attention that all my discussions on the time needed to work your Avon business had been falling on deaf ears. WHen my representative heard from a Senior Executive Unit Leader that she was working 40 hours a week, my rep was amazed that I had been saying that TOO. Based on what I had seen, I was NOT totally surprised! I have been involved in time management for many years, but I am learning new things every day about the benefits that good time management brings. Any entrepeneur, whether it is Avon or something else, should know that you spend a huge amount of time to get where you want to be. Any new business needs your time and attention to grow. However, how do you balance your leisure time with the time for your business? I have found this to be an issue a lot especially lately. I have prided myself on being available 7 days a week, but it is summer and I have things I want to do that do not involve my business. So the question is: How to do both? I am finding that setting my goals and working on them every day with lists in hand Monday through Friday are helping me find week-ends a little more free for things not business related. I am actually accomplishing more than I had before and much less stressed about what I am not getting done. The old adage “If you want something done, ask a busy person” certainly holds true in my opinion. However, as an entrepeneur, you must learn to balance your growing business with your leisure time by setting those goals, and breaking them into the bite size pieces. If you do what you need to do, when you need to do it, there will come a time when you will be able to do what you want to do, WHEN you want to do it. Dealing with discouragement and disappointment in my Avon business is a constant daily struggle. I’m sure that anyone in a small business goes through this on a regular basis. But it is not the disappointments that hurt you, it’s how you handle the disappointment. I find easiest to bury my head in the sand and just hope that things will get better. Not such a good idea!! I have had a series of disappointments in my Unit and total discouragement from several of my team members and, you guessed it, it is not getting better on its own. So the other day I decided it was time to face the problems and start being “Solution Conscious”. I have listened to more motivational CD’s in the last two weeks than I have in the last six months. I have started a Goal Board, I have set up a conference calling line, I have been on the phone and on the computer more than I did before and I did it A LOT before. I have gotten a lot of business associates on conference calls with people that know more than me and have fantastic suggestions to offer on building your business. In short, I made the effort to recognize that I was dealing with the problems in a negative way, instead of looking to see how I could change the negative things to positive ones. One of my team members pointed out to me yesterday that his motivation had to come from himself not from me. But I do believe that you lead by example and if you are motivated and excited and doing things to make your business grow, this will rub off on everyone you come in contact with. So I guess what I am trying to say is that when things are looking bleak, remember that it is how you handle the disappointments and what you do to change them that matter. Disappointments are GOING to happen, but it’s up to you to use them to your advantage and turn them around. So face today and everyday with a smile and optimistic attitude, look your problems in the eye and you will succeed. I was reminded yesterday of the effect of Negative People on my attitude! I’m sure that you know the type of person I am talking about. This lady is a wonderful person and I really enjoy talking to her. HOWEVER, I have noticed that when I get off the phone, I invariably feel worse about my Avon business. Then, of course, there is the person in your business that complains incessantly about their people, the business, everything in general. While you are constantly trying to pick them back up, you are also trying not to let them bring you down. The easiest method, if not the most practical, would be to avoid them completely. Unfortunately, at least for me, that is NOT always an option. Therefore you have to find ways to counteract the negative influences and keep yourself up and positive. I find the best way is to listen to positive motivational people on CDs in my car. Zig Ziglar is my favorite and just a few minutes of his upbeat positive and funny attitude and my thoughts and spirits are back on a high note. Another way: Quickly call a positive person. One that you know will help put you back on a mental high with your goals in place. One of the more difficult things is to identify these negative people in your life. But if you find yourself in a funk, check to see if you have talking to a negative person! While you can’t avoid them completely, identifying them will be a major step in keeping them from affecting you in a negative way. Good Luck and keep the positive thoughts flowing! Change Your Direction – Not Your Goal! As I look at my goals for my Avon business that are posted on my wall in front of my desk, I am amazed that they haven’t seemed to change. I realized recently that I kept running into obstacles that seemed insurmountable. However, since I listen to people with more knowledge than me every day on cd’s in my car, I got the answer to my question. My goals are GREAT, but I need to change my direction to get there. Too many people get discouraged when they don’t reach their goals in a timely manner. But you never change your goal, you just change your method of getting there. While I haven’t exactly changed my direction totally, I have added many more avenues of effort. It has meant a great deal more time in the office and on my computer, but I feel that the extra work in different directions will pay off. If not, I am no worse off. So if you are not getting where you want to be when you want to be there, maybe YOU need to look at the obstacles you are facing and change your direction. Good luck and I know that you WILL reach your goals with the effort you expend. I was recently reminded that leading by example is essential to my Avon business or to any business. I had been talking to all my Leadership Reps about the importance of setting, writing down, and breaking down of goals. My daughter, Amy, asked had I done it. The answer, unfortunately, was “NO”. So how could I truthfully sell them on the importance if I wasn’t doing it myself. This forced me to take a good look at what I was doing to build my business. Was I truly doing everything I could? The obvious answer was “NO”. So I have been taking a good look at what I am doing and what I am NOT doing. The quotation on my emails is “The definition of insanity is doing the same thing over and over again, and expecting different results. – Albert Einstein. Although I see it and read it every day, it took one comment from Amy to make me see it in a different light. My question today is are you “Leading by Example?” Are you doing the same thing over and over and still expecting different results? Maybe you need a wake-up call like mine to make you review your goals and your course to reach them. Getting Where You Want To BE!!! I am sure you know that it has been proven that the best way to get where you want to go is to set the goal, make a plan, and work the plan. Plans must be broken down into bite size workable pieces by the month, the week, and the day. Because of this, I am suggesting that you try it! Over the course of the next week, set your long-term and short term goals. Then, breakdown exactly what you need to do to reach that goal. At that point, you can set a plan of action for each day to make each step of the goal HAPPEN. 1. How to increase your personal customer base and orders. 2. What can YOU do to help your current recruits to grow their business and therefore retaining them. 3. Increasing the size of your Unit and moving your title upward! I would love to see these goals and plans set down in writing so that I can help you to reach them. It goes without saying that this would stay strictly between you and me, but I know that committing them to paper (or email).and sharing them makes you more inclined to working on them consistently. If you have any questions, please let me know and I REALLY look forward to hearing from you. This point was driven home to me by one of the reps in my Avon business. Since I started Leadership I have always been available to my downline pretty much anytime they needed me. I have put in orders, paid bills, motivated, comforted, and given suggestions on a daily basis. But one of my Reps that is new to Leadership constantly complained about everything she was having to do. Despite her wanting to be in a Leadership role, she resented having to do anything to help her people make their businesses a success. I truly feel that if your desire to help each person is motivated by wanting them to succeed and to get what they want out of the business, you cannot lose. Plus, I can assure you, there is nothing more rewarding then watching someone you have mentored do great things. So take today to start helping your people for the right reasons and I promise you can achieve what you desire. My very favorite motivational speaker, Zig Ziglar, often said that you don’t get motivated to go to work, you go to work and “THEN” you get motivated. For some reason, the thinking behind that statement escaped me for a long, long time! But in my Avon home based business I have discovered exactly what he was talking about. One of the things that I truly did not enjoy was making hours of precalls. So, of course, I did what every good procrastinator does: I found 99 other things that were “more important” to do. But one day I realized I was hurting myself and my business and I was just going to have to bite the bullet and make those calls. Lo and behold, I sat down and got started and realized that I was excited as I saw my list getting shorter and shorter. So now, I block out the time and just get started and about 20 names into the list I am totally motivated to making these calls. This can be true for every aspect of your daily work in your own home based business. We don’t have a boss looking over our shoulder so what we get done is up to us. Try making your list of what you need to get done every day and I guarantee that once you start that list you will be motivated to work and motivation breeds success. So as you start you new day, remember go to work and YOU WILL GET MOTIVATED to succeed. I don’t know about anyone else, but I have found that being a perfectionist can be a real draw back in my Avon Home Based business. So many times I have found that I have to keep encouraging people to just “Do It”. I remind them that any problems that arise, we will take care of them. So, now I need to take my own advice. Writing this blog is a perfect example! I am a “perfectionist” so consequently I never want to post a blog until I have had the time to do it perfectly. Unfortunately, I have realized that the time never comes when you are busy building a business. So, my advice to you and most especially to “ME” is to just “DO IT”. So if these blogs are lacking, forgive me, I promise they will get better as I get better at it. But, at least, I am accomplishing something that I have been putting off. Good Luck and remember “Just Do It” ! 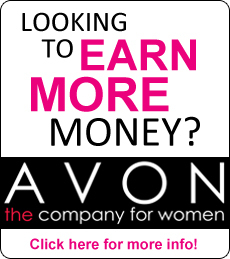 As an Avon Representative, I find one of the most daunting things is when I wake up to pouring rain. The immediate urge is, of course, to go back to bed and dream of sunshine. Unfortunately that really doesn’t help the business much. So at this point, you must get creative! Although there is always much paperwork to contemplate, there are also people to see, product to deliver, and people to appoint. However, walking into an office with rain dripping from your hair into your eyes is not the ideal image you want to portray. My customers expect me on a certain day and I am loath to change that. But, with a week of rain, I figure they will adjust and understand. So I head out to work in between the rain showers which leaves the day of 100% rain chances free to work in the office. I guess the bottom line is that if you can get creative, adjust your schedule to fit the weather and keep on working you can still keep your business growing and avoid the inevitable regrets of wasting several days and trying to catch up. So if it’s raining, or snowing, get out of bed, get creative and keep your home business growing.